Right now I am sitting on a train to Florence (which we had to run to catch) from Rome! The lady behind us smells like HORRIBLE B.O.!!!! We are realizing how easy it is to blow your money while traveling! Taxis, trains, hotels, food, shopping, wow! Yesterday was a pretty chill day, we ate breakfast with Sammie's boss at our hotel, we took the shuttle down to the Vatican and walked around. Took lots of photos!! We got a coffee at a little cafe and watched the people walk around. We then went to an outdoor market where we shopped a little and then kept walking for hours! 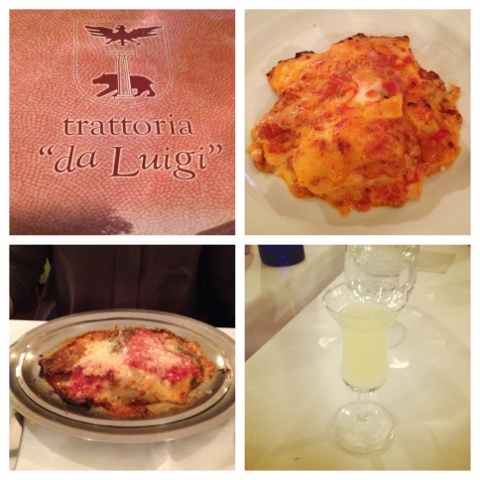 We went to a restaurant for lunch that was so cute; Trattoria da Luigi. The sever was super nice, we got the local win which is supposed to be better/cheaper so we ordered it! It was only 5 euro and seriously it was 1/2 liter!!!! So much wine, and it was so good! I honesty can't compare it to any wine I've had in the US. The wine here is just so much more delicious! After lunch we went shopping at Zara, then headed back to the hotel for a little siesta! We then went downstairs to the bar to find a few of Sammie's clients. They were headed to the hotel restaurant for a later dinner (all dinners here are late) and we joined them. Anyways, we had wine with dinner and I tried delicious pasta! We stayed up chatting pretty late then went to bed. This morning we woke up, ate breakfast, and got right to the train station... More stories from Florence to come! !